:( This is very sad, she'll always be Plath to me. Not Hughes, not at all. Awful people. Also why is her grave so lifeless, if I lived near it I would plant piles of flowers and tend to them each day. Oh you kidder Peter! This is up there with your blog becoming all about Hughes! Good one! Hey wonderfully deadpan Peter. I miss the president of Israel in the story, who has a penchant for the statements of the quoted Iranian chap. But I've got no doubts he is on pins and needles and is about to retort any time now. And I suggest Plathophiles throughout the word start signing a petition IMMEDIATELY for release of Gail Crowther. I've already begun printing "Free Gail Crowther" T-shirts & am in process of returning all my Plath books to Faber&Faber so I can get bright shiny new copies - thanks for the head's up. Julio, thank you for posting those commandments. I need to practice a few of them personally! Maybe not the "French daily" and certainly not the "stay sober"! Again you made me laugh. I still remember being tricked last year, oh I w sucked in. Hysterical! It had me going too, but Ahmadinejad and the date persuaded me otherwise. Thanks for the word, "Plathophile," as I am certainly of that persuasion. Usually am not fooled but was by this one. It made me quite sad until about half-way through, I sussed it and checked the post date. You totally fooled me! Up until the Frieda & pulping books part! Hahaha! Ha ha! I fell for it until I got to your name, and then I looked at the date of the post! Boy, I would have been terribly upset to have finally gotten to England this June to visit that grave, and have the stone removed for rework! I have just completed a disseration on Plath's grave and its elevation to the state of shrine and witnessed hundreds of people trooping to this "pilgrimage site"..sometimes a couple of hundred during a single month. During the past nine months of research I have never witnessed any vandalization of her grave, in fact I was astonished at the reverence with which all the tokens and objects on the grave were handled, nothing was ever stolen or defaced. I am angry and disappointed that such petty absurb expressions of politics should be targeted at Plath's headstone, using it like a dart board. I have taken over two hundred photographs of Plath's grave since last June which attests to the scrupulous not unscrupulous regard with which it is usually held. The lead lettering on the headstone can easily be replaced and wouldn't cost much and I am sure that the funding will be found from willing contributors like myself. Ha ha, just saw the date..!! I blogged the last comment and admit that I hadn't read the entire posting..but at least it gave some food for thought!! 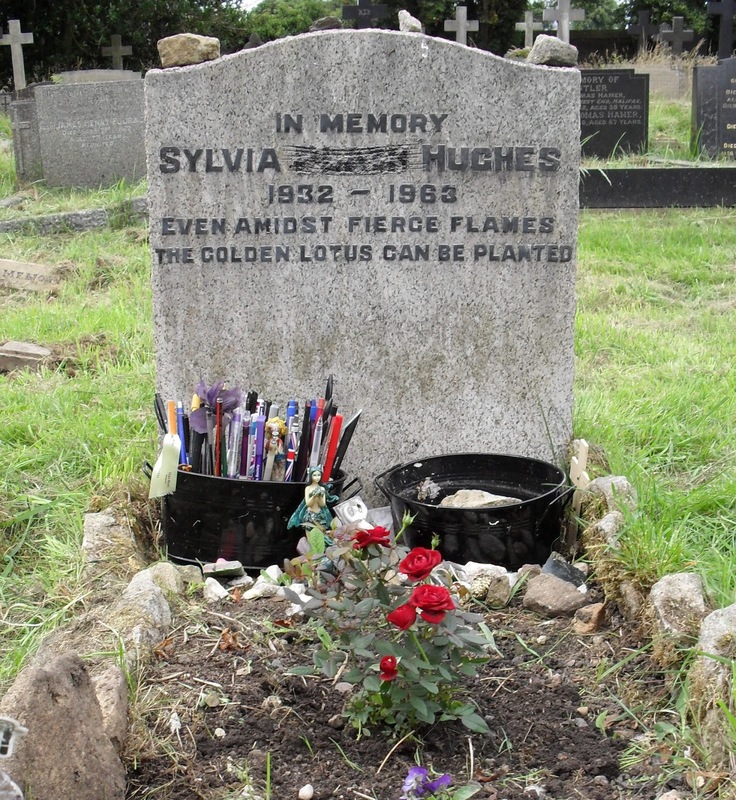 If anyone is interested in the photographic collection I have of Plath's headstone and grave site, which regularly is festooned with a mosiac of pens, notes, stones,gifts and flowers,then I can post some on the site. I invite you all to read my new blog post on Hughes and Plath through the lens of Hughes's Shakespeare and the Goddess of Complet Being. Hilarious!!! Believed it right till the Freida part:) Even the twitter jocks were swallowed up in horror...HA!